Opening Ceremonies serve up a mix of looking back and way ahead. It always feels a little odd that the Opening Ceremonies for every AES Convention are held halfway through Day 1, but this year’s edition was worth the wait. The annual event serves as an opportunity to address the Audio Engineering Society’s successes during the past year, acknowledge the contributions of noted members and volunteers, highlight award-winning technical papers and also as an opportunity for further learning in the form of the annual keynote address. A key component of the Ceremonies are the various awards, which honored members who have provided considerable contributions to the organization, as well as sometimes decades of service. This year’s Board of Governors Award for outstanding contributions to the AES was presented to Eddie Bøgh Brixen, Edgar Choueiri, Linda Gedemer, Matt Klassen, Andres Mayo, Valeria Palomino, Alberto Pinto, Daniel Rappaport, Angieska Roginska, Lawrence Schwedler, Jeff Smith and Nadja Wallaszkovits. The Fellowship Award, presented to members who have “rendered conspicuous service” or have made valuable contributions to the advancement in or dissemination of knowledge in audio engineering, was given to Gustavo Borner, Christopher Freitag, Leslie Ann Jones, Hyunkook Lee, Andres Mayo, Bruce Olson, Xiaojun Qiu, Rafa Sardina and Frank Wells. The Distinguished Service Medal Award, given in recognition of extraordinary service to the Society over a period of years, was presented to David Bialik for more than three decades of service on AES convention committees and the creation and development of their broadcast track. Closing out the event, keynote speaker Thomas Dolby drew deeply upon his work as the Homewood Professor of the Arts at Johns Hopkins University in Baltimore, MD to discuss a broad cross-section of adaptive/non-linear music and audio technologies and their applications, both current and theoretical possibilities for the future. 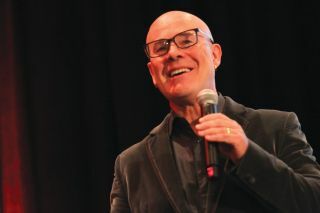 Relishing his opportunity to speak to the industry at large, Dolby jumped immediately into theorizing what a new “more conscious audio file format” suited to non-linear music creation might look like, suggesting it be a multitrack waveform, sport compression options, demarcate loop and cue points, offer polyphony, note ducking priorities and more. Segueing into a discussion of his work at the Peabody Institute at John Hopkins, the talk morphed into multiple demos of various adaptive music technologies in various game formats, before moving on to discussing hearables—a technology straddling the line between hearing aids and lifestyle earbuds—of which Dolby suggested they’ll be an explosive consumer trend within five years. While the talk firmly looked ahead in terms of emerging audio technologies, Dolby closed out with a look back to the track that made him a household name in the early 80s as he provided an upbeat rendition of “She Blinded Me with Science” that had the entire room on its feet. This article was originally published on Prosound Network.